If you followed anything I do on Geekcast Radio you would know that I tend to be a movie first type of person. I started here as a movie reviewer first, but due to some major life changes this year I saw myself watching a lot fewer movies and reading a lot more comics. Luckily for me the sheer amount of amazing comics out right now made that transition quite easy. So that inspired me to create this list of my Top 25 Favorite Comics of 2015. I will start this by saying I do try to read a lot, but I don’t read everything. Hey, there is only so much time in the day and comics can be expensive. So if there is a comic not on this list that you feel should be sound off in the comment section below. I am always looking for recommendations. It took me some time to come around to Marvel’s Star Wars books. While I overall enjoyed them, I had major issues with the inconsistent artwork and framework in which the books were placed. Having the majority of the story arcs take place in-between a New Hope and Empire Strikes Back felt like an easy way to limit the scope and impact of these comics. Nearly all of my issues with the art were removed when Stuart Immonen took over, and I feel John Cassady has quieted my worries of the books foundation. Cassady has been able to capture the magic that made the original trilogy so iconic. Material is the type of book that would bore some, irritate others, but for the select few that enjoy social conscious stories that also examine existential crises of human existence there is a great deal to enjoy. Material uses the ‘ripped from the headlines’ approach taking real life events such as Guantanamo Bay and race riots in Chicago to build stories around. As someone who wishes there were more comics that provided politically commentary I am glad books like Material exist. I will be honest and say I am a Marvel fan first, and perhaps because of that I never heard of Midnighter before I started reading this series. I know comics in the last few years have been heavily pushing to be more diverse and inclusive with characters of different races, religions, and sexual orientations. Personally I think it’s a good thing, and if anything should have started a lot longer ago. Ultimately however, it all comes down to one important thing. Is the comic good? With Midnighter the answer is unquestionably yes. Steve Orlando is able to strike the balance and not exploit his sexual orientation, but also not shy away from it. Negative Space would probably be much higher on this list if more issues had simply came out. Even with only two issues it captured my attention with a unique first issue that felt like a twisted version of Cabin in the Woods. At this point we have only scratched the service to this comic’s true potential. Now that Spider-Man is more akin to Tony Stark than the down and out hero he once was, Marvel needed a street level hero with endless bad luck and a superhero inferiority complex to take his place. Enter: Ant-Man. With Scott Lang entering the Marvel Cinematic Universe it was no surprise he also came back to the comic book world as well. What was surprising was how Nick Spencer helped redefine the character and the world around him. Moving him to Miami gave the book an immediate unique feel. There’s the self-deprecating humor you would expect, but Spencer smartly grounded the book by making Lang’s relationship with his daughter a major focal point. I know Marvel’s moniker right now is “All New, All Different”, but Spencer’s Ant-Man reminds me of everything that made me fall in love with Marvel in the first place. Sometimes it is just fun watching a anthropomorphized warthog in gigantic robes practicing magic. To be fair The Autumnlands is much more human sized animals performing magic tricks, but this taps into my love of stories like Chronicles of Narnia that are full of crazy characters and takes place in a world full of magic and wonder. Of course Chronicles of Narnia is designed for children where this is very much adult, it’s like reading C.S. Lewis with the tone of Game of Thrones. Is there anything Brian K. Vaughan can’t do? (Not surprising he will be showing up more on this list.) Paper Girls, with its retro style and focus on rambunctious kids, reminds me of classic 80’s era Spielberg. His kid protagonists speak with the same authenticity, especially when the twists and turns start coming. If you have yet to read Paper Girls I would advise doing so without knowing anything about its plot. The less you know the more you will enjoy it. As a fan of the X-Men I have grown accustomed to time travel stories, and how overly convoluted they can easily become. What impresses me about Ivar, Timewalker is not only how smooth it is laid out, but also how it how it adds interesting new ideas and concepts to time travel. That’s not an easy thing to do. I have heard a lot of comparisons to something like Doctor Who, and while I understand that comparison it has a much different flavor than Doctor Who. Its more grounded in its approach and does not have the odd wackiness you get with Who. We live in the world of reboots, relaunches, rehashes, and redo’s. Sometimes though, they make a great deal of sense. Prez relaunches a book from the 70’s that had largely been forgotten and updates it for modern world. There is so much going on in each panel you can be easy to miss some smart and insightful satirical commentary. I love seeing DC taking a chance with a book like this, and fans really need to reward them by giving it the time it deserves. When (spoiler) Howard the Duck showed up at the ends of Guardians of the Galaxy it became only a matter of time before Marvel try to relaunch him into comics in one way or another. Chip Zdarsky was a fantastic choice to bring Howard the Duck back from obscurity. As someone who has never been a Howard the Duck fan, hearing his name attached got me excited. Unlike something like Prez that needed a major update, Zdarsky keeps Howard within the same vein of his previous incarnations. I love his wiliness to even call out Marvel’s ridiculousness when it comes to relaunches and renumbering. I could see many of those jokes ruffling the feathers of Marvels executives. One thing that impresses me with Scott Snyder is his ability to take stories that on paper should be downright be awful and make them great. If you told me without context that Commissioner Gordon would become Batman and do so in a mec style Batman robot I would think the worst of the 90’s was coming back to destroy comics once again. Snyder makes it work by delving into the mind of Gordon like never before, and does not shy away from the ridiculous of what is occurring. It also helps when you have Greg Capullo drawing your comic. His work this year further cements the fact that he can do just about anything. At times doing these lists can be difficult when it comes to comics. Those series that have been so consistent for such a long time get hard to rank next to series that are fresh and new to the market. I mentioned that because this made my Top 10 last year, and with it coming in at fourteen you might think it dropped in quality. That’s not the case. The outlandish humor and insane visuals are just as good as they were in the first issue. In addition what makes this book work isn’t the insanity but rather Fraction’s ability to get into the complexity of relationships and their inherent challenges. Similar with Prez I knew nothing about past Airboy stories prior to reading this. In fact I knew very little regarding the career of James Robinson in general. Even without that I could feel how cathartic this comic had to be for him. His reflection on his career, the industry, and his life made Airboy such a standout comic. Airiboy has that edge that so many comics are missing. Pushing necessary boundaries, and always willing to go one step further than you would expect. For such a long time The Unbeatable Squirrel Girl was just a gigantic joke of a character. So what did Marvel do? Make an entire comic base on her? Really? Yes, really. They used that joke to their advantage and made one of their best comics going right now. The Unbeatable Squirrel Girl is quirk personified, which sounds awful for some people I know. It’s a sense of humor that can turn off some, but I do appreciate Marvel showing they are willing to reach out to new types of audiences. The idea of rebooting a character as iconic as Archie seems somewhat ridiculous on the service. 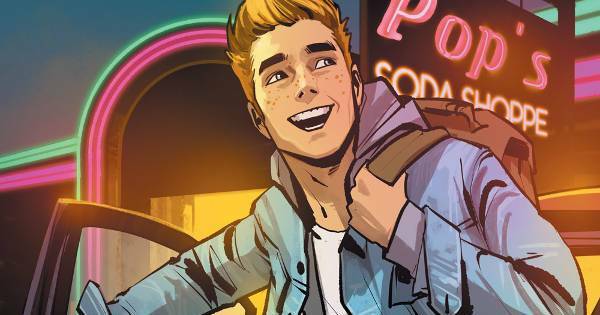 I mean are were going to get HBO level drama with Archie getting addicted to high level narcotics or maybe go another direction to better appeal to the youth of today by making all dialog occur through the use of emoticons. All bad choices I grant you. Mark Waid realized what is not broke does not need fixing. Sure some of the service level things have been updated like hair styles, nicknames, and some basic lingo. The heart of what made Archie, Archie is still very much there. A good comparison is the Peanuts film that came out this year well. Both understood the values each propriety represent, and the key is not to change those values but to show how they relate to people today. Another year another big summer Marvel comic event. I personally have not got this involved in a Marvel event since Civil War.These types of stories often get compared to summer blockbuster films with their massive scopes, huge action set pieces, and major hype. If Secret Wars was ever made into a movie it would need to be directed by someone the likes of Christopher Nolan with its dense and high level story telling. That is what separates it for me from other Marvel events for me. Jonathan Hickman brings a gravitas that has been so absent from events like this from such a long time. This is the first year I got into Valiant Comics, and how do I wish I started a long time ago. The Valiant mini-series got me started (an honorable mention for this list) and the one character that stood out for me was Bloodshot. As a Marvel fan it is hard not to compare him to characters like Wolverine and the Punisher. Similar to Wolverine, Bloodshot also had to deal with life without his healing ability. Gratefully it was dealt with so much more tact and emotional insight than anything in the Death of Wolverine story line. Although I have limited knowledge of the character of Bloodshot Jeff Lemire made that issue null and void by conveying the emotional toll this character was undertaking. For those that have yet to pick up a Bloodshoot comic this is actually a great place to start. Deadly Class is making a repeat appearance in my Top 10 this year. Everything I loved about the comic last year has only continued. What I have found interesting about this comic centered on a high school of Assassins is how unconventional that setting has been used. There is very little use of the ‘class’ in Deadly Class rather focusing on the characters and their relationships with one another. Within the violence and vulgarity is a really human story of some truly damaged individuals. The subject or artificial intelligence is often found in the realm of Science Fiction. Everything from Terminator to this year’s Ex Machina touch upon it in their own unique way. Descender should also be added to the list of stories that bring new intrigue and questions to this well worn subject matter. In addition Dustin Nguyen gives some of the best artwork of the year with his breathtaking watercolor approach. There is no other comic on the shelves right now I enjoy simply looking at more than Descender. Jonathan Hickman has quickly made his way into my list of favorite comic book writers. This year two of his comics made their way into my top 10. East of West made my top 10 last year as well, and it has only gotten better. As the series has continued its world has become more compelling as Hickman has fleshed out all these different characters and their motivations. There is so much going on in each issues its hard to say what genre it would even fit in. Each issue is a new experience, and I can’t think of another book on the shelves that can claim that. Burning Fields wins the award for me for the most underrated series of the year. Maybe one of the most underrated series in the last few years. The idea of a murder mystery taking place in occupied Iraq has a lot of of promise on its own, and Michael Moreci expanded upon that by adding in a well developed supernatural element. The great success of Burning Fields lies in the relationship of its two main characters. Two police officers from different lands, with different ideologies, and very different methods attempting to work together to solve of life threatening problem. It may sound stereotypical but Moreci adds enough unique layers and emotional resonance to make it standout. Colin Lorimer gets better and better as the series contiues. He gives it a tone akin to the best David Lynch films. What more can be said about Saga that has not already been said? It was my number one last year, and could have easily been number one again. I am not well versed in the English language enough to properly praise Fiona Staples’s phenomenal artwork. The number one element that has stood out for me since the beginning is the color of the book. Bright and unique colors that that you tend not to see used in comics, especially one of this nature. Brian K. Vaughan can pretty much do no wrong in my eyes. People often underestimate the power of comics when it comes to providing social and political commentary. We have come to expect it with things like movies, books, and television, but comics tend to be look at as a medium incapable of high level human analysis. Enter John Lewis and his autobiographic novel March. This is the second installment of a trilogy that covers John Lewis’s life and work during the Civil Rights movement. No other book on this list brings the level of importance this book does. Its a comic all should read even those who are not fans of comic books. It shows how in some ways comics are as good as if not better than any other medium at presenting a story so full of raw emotion. I feel like The Fade Out was personally made for me. For one its written by my all time favorite comic book writer Ed Brubaker. He and Sean Phillips also created one of my all time favorite runs for Captain America—my all time favorite superhero. In addition Noir/Crime is one of my favorite genres. I have huge interest in this time period, especially the classic Hollywood era. Not only the movies of that time period, but also the insane politics and shady things studios would do to gain success. So before I even read a word I was ready to love his book, and luckily The Fade Out just happens to be a fantastic comic. One of the best things Brubaker has ever written. I will be honest and admit this was a rather easy choice for me. Southern Bastards was the book I looked forward to more than anything else this year. What makes Southern Bastards such a standout is how each issue can standout on its own, but at the same time deepen the overall series. The best example of this would be issue number nine where we get to spend time with Sheriff Hardy. Its a great example of comic book storytelling. Aaron takes what was a background character and in only a few panels gives you a context that makes him both sympathetic and compelling. He does not stop there as with the final pages he provides just the slightest of twists that recontextualizes everything that came before. Southern Bastards created deeper characters in one issue than some comics do in entire series. Jason Latour’s art ties it all together. He gives characters so much personality. Faces are worn, ragged, and say more than any words ever could. Its a book that takes chances in each and every issue. That’s what made Southern Bastards the best comic of the year for me.